Jacob Poirier, a second-year Social Work student from Wilfrid Laurier University's Brantford campus, found each of Laurier's work-study opportunities offered through his program area so interesting that he applied to all of them. The Faculty of Social Work ultimately offered him a position to undertake a research project for the City of Brantford on Post-Traumatic Stress Disorder (PTSD) and first responders. It was a perfect match for Poirier, who grew up in a first-responder family where these issues were discussed regularly. "The City of Brantford is working to enhance the support structure for first responders and emergency personnel who experience post-traumatic stress disorder," says Aaron Wallace, Director of Strategic Planning and Community Partnerships in the City of Brantford's Health and Human Services Commission. "We identified the need for a research brief that outlined the current literature and best practices related to mitigating the incidence and impact of PTSD." Poirier's personal experience and passion for the project motivated his research, which involved connecting with a diverse range of subject-matter experts, policy analysts, and emergency personnel throughout Canada. His report will directly inform future project planning for city-led health and safety initiatives. 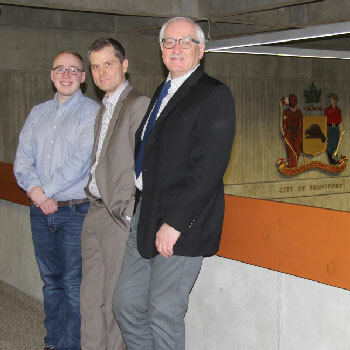 "Developing this report was really encouraging because it emphasized the priority placed on developing occupational mental health programs by the City of Brantford and Laurier," says Poirier. The opportunity was made available to Poirier through the Laurier Work-Study Program (LWSP), a program within the university's suite of experiential learning opportunities that provides paid employment to students in financial need. Wallace stresses the impact of ongoing student partnerships, including the LWSP, as ways for students to develop career-focused skills and make an important social impact within the public sector. While community engagement is not a component of all work-study positions, meaningful self-reflection is a requirement. The program was recently redesigned to include multiple points of reflection throughout the student experience. Poirier met with Robert Basso, his LWSP supervisor and associate dean of the Faculty of Social Work at Laurier's Brantford campus, several times throughout the project. They brainstormed different ways to approach the research, identified challenges, and reflected on Poirier's changes and development in the areas of communication, project management, and personal values. "Given the sensitive nature of discussing occupational stress and PTSD, I continued to develop my ability to empathize with others who have deep connections to the subject matter," says Poirier. "This project also really tested my organizational skills. I am normally an organized person, but having to facilitate correspondence from first-responder organizations, three levels of government, as well as professional associations, was tricky." Poirier's guided process of reflection with Basso is a key marker of experiential learning, allowing students to walk away from experiences with a clear understanding and documentation of the competencies they gained during the process and how they connect to their future goals. In addition to these developmental reflective exercises, experiences like those found in LWSP give students a chance to network with staff, faculty, and professional organizations that they may not otherwise have the opportunity to engage with. The majority of work-study positions take place on campus. With recent changes to the funding structure allowing Laurier departments to pay a portion of the student's wages, the number of work-study opportunities available to students has increased by 65 per cent. Information for students interested in applying to the LWSP for fall 2018 can be found on the LWSP page. Laurier departments and faculty members interested in submitting a position for consideration should contact the LWSP coordinator.